A New York couple expecting their first child have been killed in a car crash on their way to hospital, but the unborn baby survived the accident. Nachman and Raizy Glauber, both 21, were travelling in a taxi in Brooklyn when it was involved in a collision with another car close to their home. Both were pronounced dead in hospital but the premature infant was delivered alive, police said. Police are seeking the driver of the other car, who fled the scene on foot. The driver of the taxi in which the Glaubers were travelling was in a stable condition in hospital, police said. 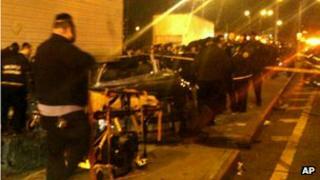 The crash happened shortly after midnight a few blocks from the Glaubers' home in the Williamsburg area of Brooklyn. The trip to hospital was related to Mrs Glauber's pregnancy but it is not clear if they were going there for the child's birth. The cause of the crash is under investigation and police are looking for the driver and a passenger in the other car, who fled the scene. The Glaubers were members of Brooklyn's ultra-orthodox Jewish community - the largest in the world outside Israel. "It's a terrible, terrible tragedy," community leader Rabbi Bernard Freilich told the New York Post. "They were going for their first child. There are no words, I don't even know what to say."